Faster and Louder: Jazzed Up And Bonkers!! Being a child of the '70s and '80s, I grew up in the days when listening to the radio was still awesome. And while concentrated corporate ownership and automated playlists have essentially sucked the soul out of commercial radio in recent decades, so-called "alternative" formats have really picked up the slack. You've got college radio, satellite radio, community radio, Internet radio, podcasts....lots of places to find great tunes played by individuals who are passionate and knowledgeable about music. One of my favorite current radio programs is Jazzed Up And Bonkers!! - hosted by that dynamic duo of Travis Ramin & Dan Henry. It runs on KFAI- a community radio station in Minneapolis/St. Paul. You can stream episodes right off of the station's web site. As the name of the show suggests, Jazzed Up And Bonkers!! is pure, crazy fun. Imagine a cross between Dr. Demento and Little Steven's Underground Garage. Travis and Dan engage in amusing banter, play lots of funny retro audio clips, do a few comedy bits, and of course bring you tons of great music. If you're even an occasional follower of this blog, you will love the selection of songs they play. 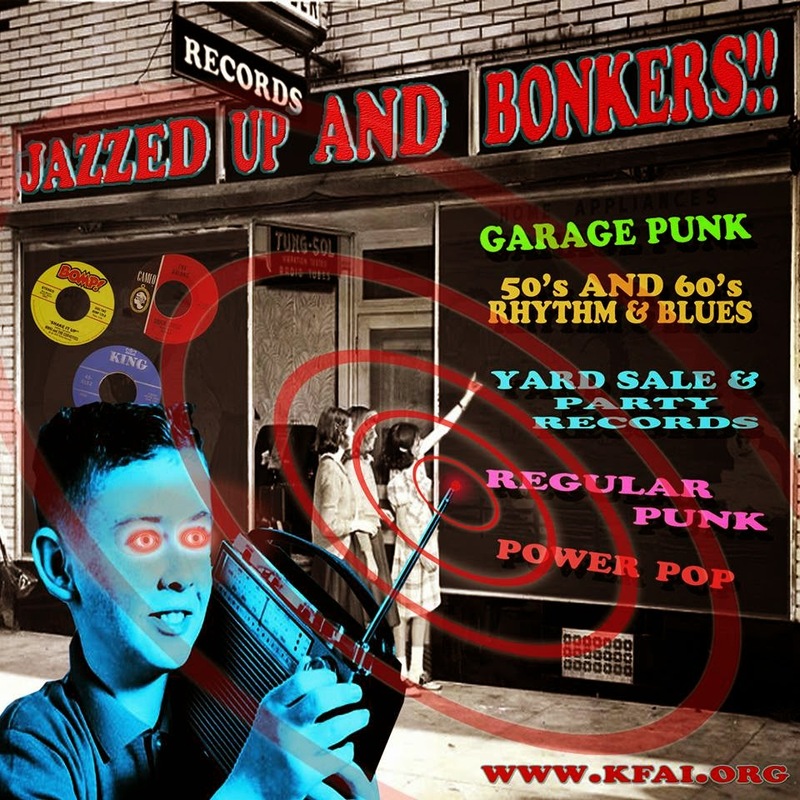 I'm talking punk, garage, power pop, classics and rarities from the '60s, old country and rhythm & blues, novelty songs...basically everything that's good! The most recent episode (#25) features everyone from The Remains to Connie Francis to the Devil Dogs to Louis "Blues Boy" Jones to the Marked Men to Jimmy Dean. The theme of the episode is the 45th anniversary of the release of Kick Out the Jams. And my favorite rock n' roller, Tina Lucchesi, calls in for an interview with the fellas. I think what I like best about Jazzed Up And Bonkers!! is the way Travis and Dan combine their encyclopedic knowledge of music with a genuinely creative take on the radio show format. It's just fun to listen to these guys sit there and talk about music (well, I assume they're sitting - for all I know, they could be bouncing on trampolines or playing Nerf basketball). I totally connect with spontaneous conversations about The Undertones being The Searchers of the '70s or the mystery of why The Figgs left "Lynette" off their first LP. And since my pet peeve in radio is when people try way too hard to be funny (e.g., any morning drive show on the air today), I like that these two guys really are funny! I could be wrong, but I'm pretty sure that Jazzed Up And Bonkers!! is the only radio show in the history of time to play Ariane's "Tu Voudrais 'que Joublie" and Cactus's "Parchment Farm" back to back. Listen at work and enhance the quality of your day. Or better yet: call in sick, make yourself a big sandwich, shut off your phone, and enjoy the best radio program out there! Trivia question: what does this post have in common with my last post?